Safer Line Expands to Accommodate Varying Merchandise Sizes. InVue expands its line of Safers with the addition of four new sizes, now offering a total of eight Safers to protect today’s high value merchandise. 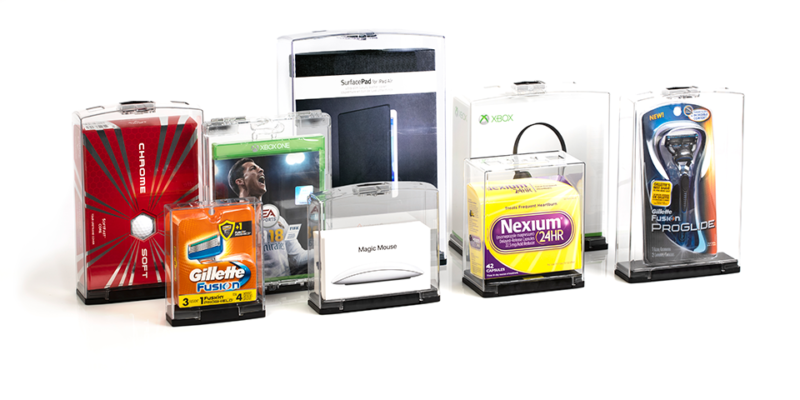 Safer provides a secure enclosure for general merchandise that can be easily concealed. Designed for shelved or hanging merchandise, a Safer offers full product visibility while protecting merchandise in a fully enclosed housing. Merchandise remains both fully visible and fully secure. The Safer cannot be defeated by magnets and hang tabs add additional security layers when used with InVue secure fixtures. The Safer product line is designed to fit today’s popular consumer electronics accessories, shave products, over-the-counter merchandise, sporting goods accessories, and many other high value, hanging or shelved merchandise. Safer is part of the exclusive InVue OneKEY ecosystem™, a security and merchandising ecosystem designed to improve customer service, decrease theft, and increase profits. To learn more about Safer, click here.